After breakfast in Pasticceria Marchesi (Via Santa Maria alia Porta 11/a), a visit to Duomo Cathedral, the touchstone of Milan. Duomo, the heart of Milan, is the biggest Gothic cathedra in the world. After strolling in the interior of this magnificent cathedral, climb the 166 steps to the top for a splendid view of Milan. Then a shopping trip to the ‘quadrilateral of fashion’, synonymous with Milan, is essential. Wander the side streets of Via Montenapoleone, Via della Spiga, Via Santo Spirito, Via Sant’Andrea and Santa Maria Novella, Corso Magenta, to keep up with the latest trends in the stores and shop windows of fashion pioneers like Dolce & Gabbana and Tom Ford. After an intense walk, you can try Bistrot Giacomo (Via Pasquale Sottocorno 6), the restaurant opened in the yard of the superb store Aspesi (Via Monte Napoleone 13) or the great cafe, 10 Corso Como (Corso Como 10). This cafe and trendsetting concept store (bookshop » and gallery) created by Carla Sozzani is a great destination even if just to get inspiration. 10 Corso Como’s outlet store Via Tazzoli 3 is the smarter choice with affordable prices. Then you can visit the Triennale Design Museum (Viale Emilio Alemagna 6). For dinner, creative and original restaurant Home (Via Tortona 12) is the ideal address. Then you can watch an opera at Milan’s famous La Scala (Via Filodrammatici 2). The neoclassical Teatro alia Scala, built by Architect Giuseppe Piermarini in 1778, is the oldest opera building in Europe. There is an opera museum right next door to the building that has hosted the most important operas of the world to date. If you can’t find tickets for the opera, enter the building from the side road 10 minutes before the show begins. You can always find tickets to watch the opera from the highest balcony standing -and for just 12 Euros. After breakfast and morning coffee in Buigari Hotel’s wonderful garden (Via Privata Fratelli Gabba 7/b) visit the Santa Maria delle Grazie Church (Piazza Santa Maria delle Grazie 2) to see the famous Leonardo da Vinci mural, ‘The Last Supper’. You need to make a reservation weeks ahead to see this piece. Then visit the concept store and gallery Spazio Rossana Orlandi (Via Matteo Bandello 14/16) that brings together art, design, photography and fashion. After leaving this delightful shop in which you can spend hours, you could go to Latteria di San Marco (Via San Marco 24) for lunch. The family establishment with only seven tables does not accept reservations or credit cards but is worth the extra effort. It’s shopping time again. This time if you want to reach into the past you can peruse the clothes and books in the Libri & Robe vintage store (Via Della Moscova 15), then stop by at another vintage legend, Elio Ferraro Gallery (Via Pietro Maroncelli 1). 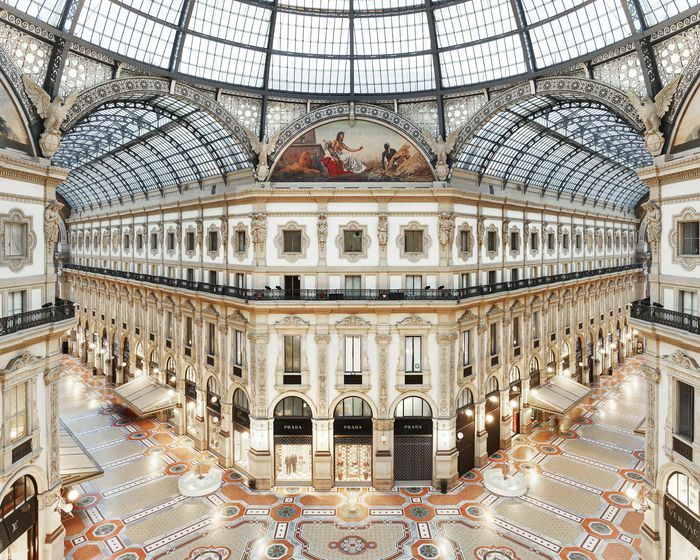 Then you head towards Duomo Square and visit the neighboring Galleria Vittorio Emanuele II considered one of Milan’s most important buildings. This splendid arcade, built in 1865, has a glass dome and contains stores of some of Italy’s most important labels. After shopping, the best choices are Cafe Radetzky (Largo La Foppa 5), an Italian classic, or the tiny bohemian enoteca, N’Ombra de Vin (Via San Marco 2). Alla Cucina Economica (Via Francesco Guicciardini 8), a new Milan gourmet gem, is a very pleasant venue for dinner.